AMERICA/NICARAGUA - Bishops' spokesperson: "It is urgent to bring democracy back to the country"
Esteli (Agenzia Fides) - The creation of the Blue and White National Unit network (UNAB), a group that brings together various acronyms and associations, will work with the hope that "it will be able to achieve its goals of bringing democracy back to Nicaragua", necessary and important step for the future of the country: says the Bishop of the diocese of Esteli (Nicaragua), Secretary General and spokesperson of the Episcopal Conference of Nicaragua, Mgr. Abelardo Mata Guevara who, in a note to Fides declares: "All efforts to strengthen the civic will to generate a solution to our socio-political problems are always welcome and we hope that this newly created National Unit will achieve its objectives". The Bishop stigmatized "the level of violence that this government has reached", hoping for a democratic future for Nicaragua. Dialogue in the country has been suspended since mid-June. 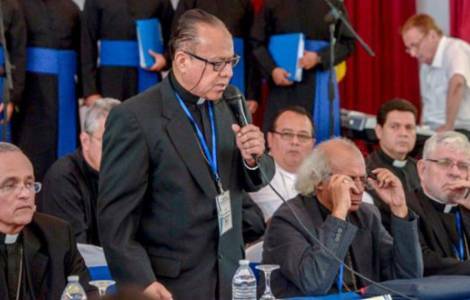 The Catholic episcopate insisted that the executive should continue talks with the Civic Alliance for Justice and Democracy, but President Ortega has not responded to the letters sent to him. Despite the attacks on the Catholic Church, the Bishops' Conference insisted on dialogue. "We insist on the need to find a peaceful and effective way out of the social crisis we are experiencing, provided that there is a sincere love for the search for truth and justice, and without distorting reality", said Mgr. Mata. At the beginning of the crisis, last April, Ortega was forced to ask for a dialogue and asked the Bishops to be mediators and witnesses (see Fides 28/04/2018 and 15/05/2018). However, according to observers, the regime's interest was only to lower the guard to calm the water. In the following months the police and the paramilitaries again intervened violently against the population that continued to demonstrate. Later the government undertook a defamatory campaign against Catholic Bishops and priests (See Fides 23/05/2018 and 27/07/2018), many of them were insulted and physically attacked by groups in favor of Ortega, who also violated the parishes.